High quality 4 outlet powerboard suited to domestic and commercial applications. PT0333 is a high rated base unit offering surge and overload pretection to your appliances. Protecct valuable audio, video, entertainment and computer equipment. 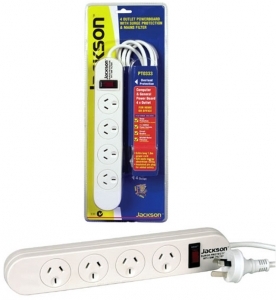 Extra long power lead, right angle plug to fit easily and neatly behind furniture. Supress both EMI and RFI (Electromagnetic and Radio interference) is an added feature.